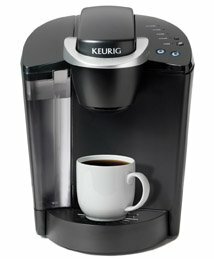 The Keurig Home Brewers, or the K Cup Coffee Makers, are currently the most popular coffee makers around, as far as single serve coffee makers go. Why is Keurig so popular? Keurig offers unparalleled service and quality that makes it the end-all to single serve coffee, which most, if not all, single cup coffee drinkers aspire to have one day. All Keurig Coffee Makers are designed and built with the quality that Keurig is well known for, whether it’s the humble B30 Mini to the highly acclaimed B70 Platinum. These K Cup coffee makers are easy to use and easy to clean. To brew a cup of coffee, just insert a K Cup into the unit and press the brew button. That’s it. There’s no more need to estimate, measure, and grind coffee beans. Brewing a cup of coffee is quick, too. To clean it, just dispose of the used K Cup and the unit is ready to brew another cup. There’s nearly no need to clean the unit at all. Another reason why Keurig is so successful is because of the K Cup. The design of all its coffee makers revolves around their use of the K Cup. What is a K Cup? Each K Cup serves as the filter basket that contains the filter and coffee grounds. That is why there’s hardly any cleanup involved after each use since the unit itself has no filter to clean. Furthermore, each kind of K Cup has its own distinct flavor. In fact, Keurig offers hundreds of kinds of K Cups, each one corresponding to one flavor of gourmet coffee. This innovation coupled with the wide range of K Cups available place Keurig at the top of single cup coffee makers. Whether you like extra bold, light, medium, dark, flavored, decaffeinated, half-caff, kona, organic, seasonal, or free trade coffee, there is a K Cup that you can buy. You can literally enjoy any coffee flavor known to man because of the partnership that Keurig shares with various coffee brands. The best part about all of this is that you don’t need to actually learn how to prepare these flavors to enjoy a good cup since they all come in K Cups. Each cup you brew is perfect. As long as Keurig does not sway from its dedication and commitment to bring the best quality coffee makers and their distinct service in offering wide selection of K Cups, it will still remain as the end-all to single serve coffee. For the time being, the K Cup Coffee Makers still reign supreme.